I just finished The Help, by Kathryn Stockett. Great. Now what I am going to struggle to stay awake to read at 1am when I know I should be sleeping because Tater is a 6am girl? There is always this vague grief that goes along with finishing a book that has attached itself to you. You start to watch the pages on the right side thin. At first you’re excited that you are so close to knowing whats gonna happen, and then you resist it, knowing you aren’t ready to let go. You read the last page slowly, savoring the last minutes you will ever spend with the characters and then you just sit, one hand on the cover. Smooth it with your hand, think about what the characters will likely do next, briefly wish for a sequel, and then…bake a cake. In the book, Minny is a sass mouth southern maid that can bake her way out of just about any situation her impetuous tongue can put her in. I love her. In the movie, Hollywood cast her with Octavia Spencer, my brain cast her with Gabourey Sidibe. 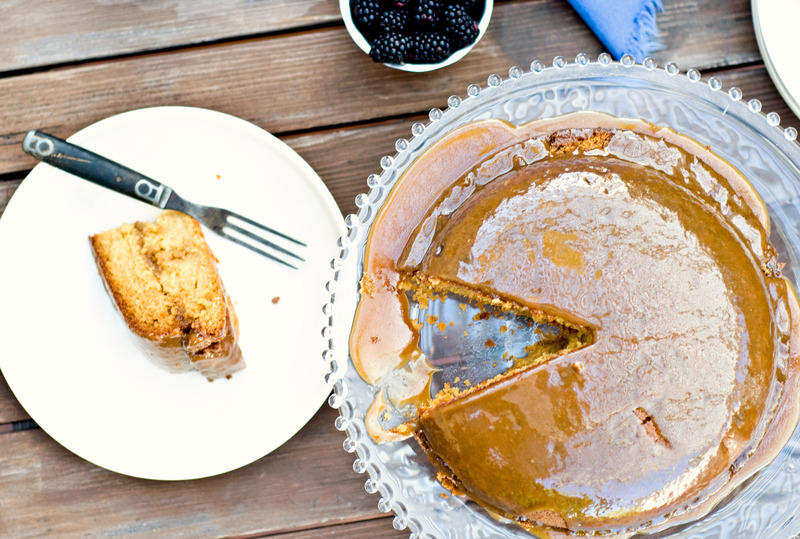 I thought a lot about what kind of cake Minny would make for that caramel cake of hers. Definitely not a white cake. Not just for the obvious double entendre, but because it calls for dissposing of the egg yolks. Minny would never do that. She would never NOT use something as lovely and perfect as an egg yolk. She would have used whole eggs, butter, oil, cream and molssas. I also saw this as a cake that would stand on its own, with a mild caramel flavor, even without the lovely caramel icing. In the bowl of a stand mixer, add the butter, brown sugar and white sugar and cream until well combined. Add the eggs one at a time, mixing well between each addition. Add the molasses and mix until combined. With the mixer on low speed, add the cream, oil and milk and mix until well combined. add the flour, baking powder, baking soda and salt and mix until just incorporated. Add evenly between two greased and floured 8 inch round cake pans. Bake for 25-30 minutes or until a tooth pick come out clean. Allow to cool. To make the lovely frosting, and I really think that I want to take a bath in this stuff, combine the brown sugar and cream in a pot. Stir over medium high heat until it starts to boil. Allow to boil, without stirring (this is the hard part for me) until the temperature reaches about 210 (about 7-10 minutes). Remove from heat and stir in the butter and the vanilla. Allow to cool until thickened. Pour half the caramel over the first layer, stack the second layer on top and then pour the rest over that. Yum. I want to make cupcake versions of this soon. 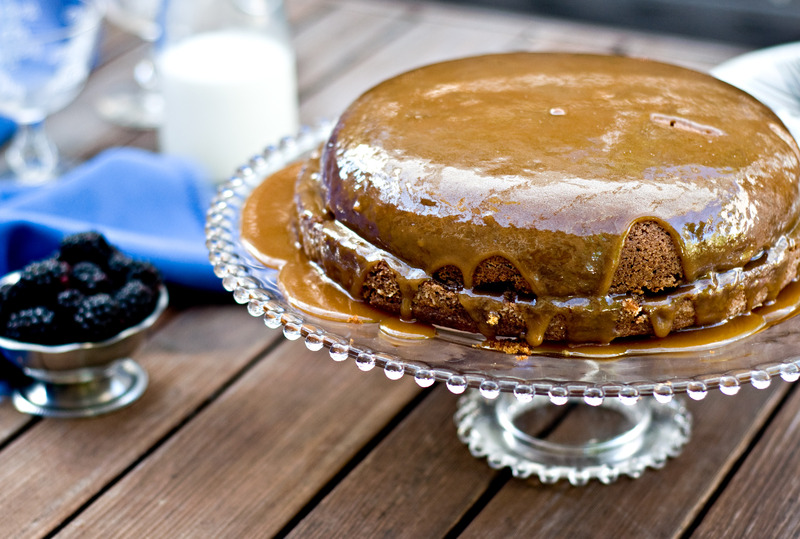 That caramel cake looks extremely scrumptious! What a sinful treat. I just finished reading this book a couple weeks ago, and it was ahhh-mazing. 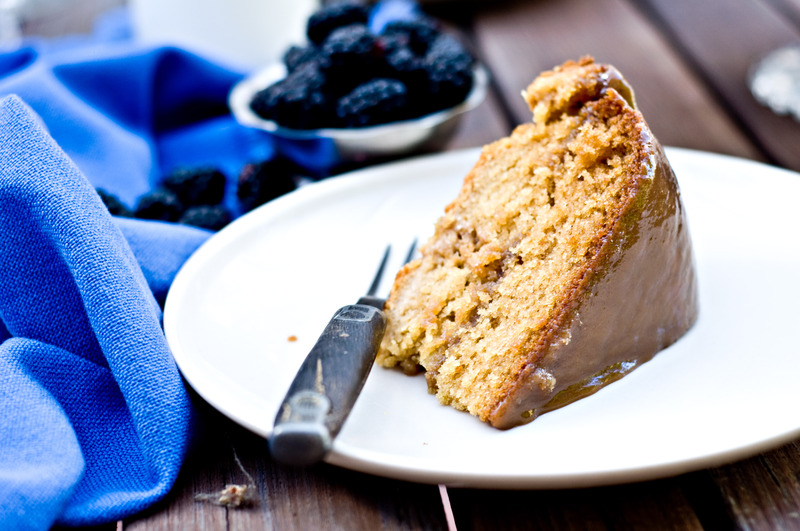 I couldn’t put it down, and I love that you made Minny’s Caramel cake. I might have to use this for my friend’s birthday cake! Thanks! Thanks for putting in words my feelings for this book. These characters were with me long after I finished. I cast the book too, hope Hollywood was right about their choices. Can’t wait to make the cake, I’ll bake it when all the Girls go to the Movie. Looking forward to following your blog. I know exactly how you feel! I had a hard time letting go of the characters when I was done with the book, but I can’t wait to see the movie. I hope they do it justice. I do LOVE Emma Stone as Skeeter. Nice choice to serve this to a group of senior ladies – it looks soooo decadent scrumptious…I’ll try it soon. I like your photos very much! I absolutely loved this book and can’t wait to try this decadent caramel cake. my book club read the book this month and will be seeing the movie together next week. what an awesome addition this cake would be! I read it for my book club too =) I think I’m going to make the cupcake version for our meeting and I’ll post it when I do. I want to whip the frosting with powdered sugar and see how that turns out. I guess we’ll see! I recognize the stand this cake was served on – My mother collects candlewick and she has the exact same cake stand! The cake sounds delicious! well—i made this and i must so~~~~t stinkin’ die for!!!!!!!!! i wanted to tweet about i but cant find you on twitter??? do you tweet??? My grandmother made THE BEST caramel cake ever. Unfortunately, she did not write down recipes and I never thought to write it down until after she started suffering from dementia and it was too late. 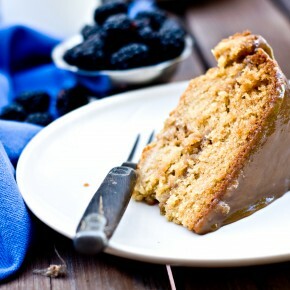 I’ve been trying different caramel cake recipes for years to try to replicate her recipe and will give this one a try! The Help is an awesome book too, by the way! I am currently reading ‘the help’. And I am enjoying it so much. I have been trying to make the book last, but each evening am finding it becoming more difficult to put down. I have been dreaming of caramel cakes for days! And am now going to have to make one uaing this recipe. It looks delicious!!! HAVE YOU GIVEN ANY THOUGHT TO THE INGREDIENTS IN THE CHOCOLATE PIE? 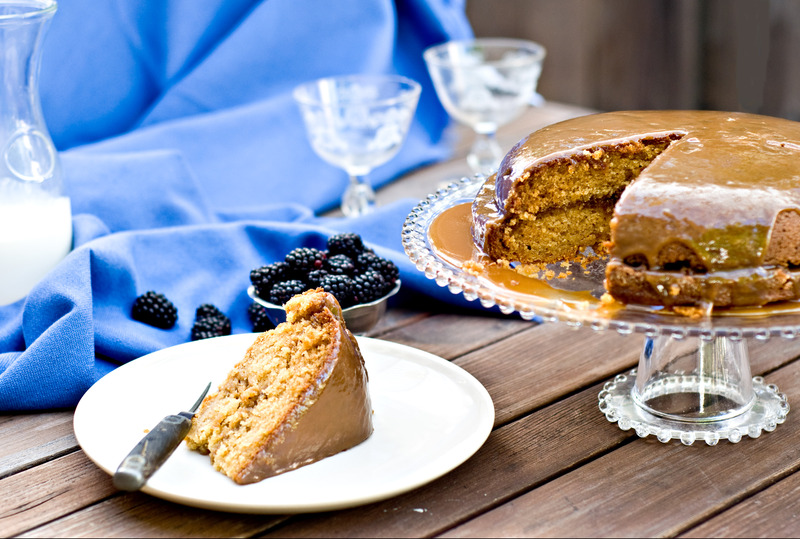 I’ve been dying to try caramel cake ever since I read “The Help,” and thanks to your recipe, I finally got my fix! It was even better than I imagined it would be while reading the book. Even my husband, who doesn’t get excited about sweets, had a second slice. Delicious!! I sprinkled the top of the cake with a little coarse salt, and it was divine.